Thanks to We Are Never Full reader/commenter Valerie (see Under Pressure), we decided to check out Epicurious.com’s recipe for Asian Beef Short Ribs. This inspired me to use our pressure cooker again, using the Epicurious recipe as a backbone for our own creation using Pork Ribs. Months ago we ate in Little Korea in NYC (YUM! That’s a whole other post!) and after our gut-busting meal, shopped at a local Korean market where we picked up a beef marinade. Although it’s not necessary to use for our recipe, I think it added a little bit more body (and maybe saltiness?) to the dish. The end result was a very rich and satisfying meal. If your butcher can’t cut up your pork ribs to 2-2.5 inch pieces, hopefully you have a super sharp knife/cleaver to try out your hacking skills! I hacked my own up – it gave me a real burst of adreneline and helped me get out some aggression! Also, remember to hack up your ribs BEFORE you marinate them. I was an idiot and looked like I honestly hacked something to death with all the marinade splattered on my shirt! Marinate your pork rib pieces for a few hours (if you have time) in the Korean BBQ marinade or the hoison sauce. Heat up pressure cooker and add a bit of olive oil on medium-high heat. Add pieces of pork ribs and brown on all sides. Remove ribs and reserve on the side. Deglaze the bottom of the pressure cooker with your stock. Make sure you pick up all the browned bits on the bottom with a wooden spoon! Add back your ribs and ALL the other ingredients (including any extra Korean Kalbi/hoison sauce that was used for the marinade. Cook in your pressure cooker for 30 minutes. Remove lid and reduce sauce even more, simmering for about 20-30 minutes. Add some cornstarch to thicken if necessary. 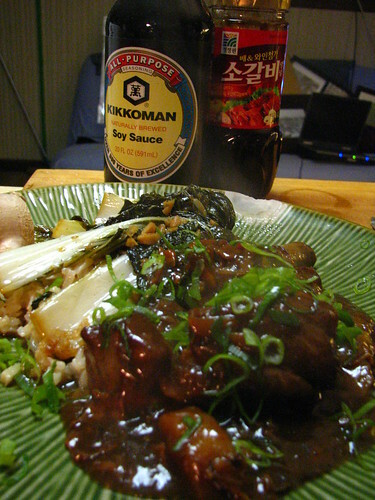 Serve with white rice/stick rice and some bok choi sauteed with garlic, chiles a bit of soy and a bit of sesame oil. Sprinkle thin slices of scallion on top and enjoy! Super easy! The added potatoes and carrots make for a really hearty sauce. You’ll love how the pork falls off the bone. Thanks, Valerie for the inspiration! Happy Columbus Day! This sounds really yummy! I am thinking it would work ing the slow-cooker! The flavors sound delectable and your pix make me want to lick my fingers! Making this tonight, cannot wait! Love using my pressure cooker, and have experimented with quite a few pork rib recipes….and this is by far my favourite! !